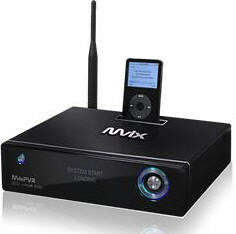 GeekTonic: Mvix PVR - Possible Competition for the Hauppauge HD-PVR? 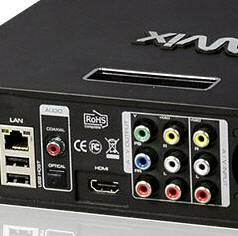 Mvix PVR - Possible Competition for the Hauppauge HD-PVR? 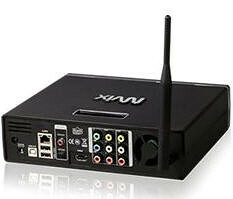 Mvix, known more for media players and other similar devices is sneaking out a very interesting device they’ve named the MvixPVR. It’s a linux powered device that seems to be focused as a PVR device that has component recording which if true could be quite exciting. All of this makes the device seem like a cross between an “AppleTV”-type device and a HTPC. Most interesting though is that it has component inputs that supposedly will be able to record to mpeg-2. This would put it in lonely company with only the Hauppage HD-PVR having that type of ability to record from the component outputs of devices such as a cable or satellite box. If it actually does have this functionality it will be interesting to see how they pack that analog signal into a mpeg-2 file on-the-fly for liveTV. The Hauppauge HD-PVR does this, but component recording is its only purpose and it does so to H.264 to keep the picture quality high with a smaller file size. Beyond the component capture, I’m also curious about what PVR or HTPC software they’ll have on the box. They state the box is compatible with Windows, Mac and Linux PCs which has me scratching my head. If they mean it can access files from those OS’s thats one thing, but if it somehow works with another HTPC software program I’d have to guess it was either SageTV or XBMC as they are the only PVR/HTPC software programs that I know of that can work on each of those platforms – and I think only SageTV does that and handles PVR functions. This product is expected to be displayed at the January 2009 CES show. Of course, price and availability are unknown at the moment. UPDATE: I Just got confirmation that this is SD-only (as many comments have pointed out) and the there is no component out. Sorry about the misinformation - was told incorrectly and then misread the specs... And so, this device is much less interesting after realizing that.